Welcome to my viewing diary for Mad Men. Most days (except Saturday) I am offering a short review of another episode until concluding the first season. Later seasons will be covered at another time. I have never seen this series before so there will be NO spoilers. Story (aired on August 9, 2007/written by Lisa Albert; directed by Tim Hunter): For what shall it profit a man, if he shall gain an apartment and lose his own job? Not that Pete's soul doesn't feel a bit crushed by the situation too. His literal honeymoon ended before the last episode, but now it looks like his "honeymoon" period is fading too. As his wife Trudy (Alison Brie) pressures him into buying an expensive unit in a high-rise, embarrasses him by soliciting her parents' financial support when his parents won't deliver, and annoys him with her chatty, slightly claustrophobic devotion, Pete can barely disguise how perturbed he feels. Gone is the smug twerp from previous episodes, except for a fleeting moment or two of deserved, and sympathetically defiant, pride in an advertising pitch he came up with. Ironically, this is exactly the gesture that will nearly annihilate his position at Sterling Cooper. Both Don and Roger are insistent that sockless big boss Bert Cooper (Robert Morse) fire Pete but the deceptively casual half of the company name demurs. The Campbells, or rather the Dykemans (Pete's mother's family) are among the tiptop social elite of Manhattan, tracing their lineage back to hardy pioneers who farmed alongside the Roosevelts centuries ago. They could close too many doors, so Pete gets to stay (although Roger tries to save face by telling the trembling young man that it was Don who ultimately saved his job). On the home front, despite her hesitance (but fueled by her curiosity), Betty draws closer to Helen's dysfunctional world, meeting Mr. Bishop (Stephen Jordan) when he angrily knocks on his ex-wife's door and then asks Betty to use her phone (she declines). Later she babysits for the offbeat family while Helen volunteers at the Kennedy campaign's headquarters. She scolds the young Bishop boy, Glen (Marten Holden Weiner - the creator's son) when he walks in on her in the bathroom and stares instead of closing the door. When he cries and compliments her beauty, she allows him to cradle a lock of her hair. As she muses to her therapist Dr. Arnold Wayne (Andy Umberger), the child isn't getting what he needs from his family...something Betty herself knows about, of course. There's a pattern in most of these early episodes which may or may not continue with time - each one seems to focus primarily on two characters, usually a man and a woman (in the premiere it was Don and Peggy, this time it's Pete and Betty), while others hover mostly in the background to play a supporting role. Don of course always remains central, but (though I didn't measure it) I'd wager we spend more time with his frustrated underling in "New Amsterdam"; indeed, Pete's storied family history lends this chapter its bemused title. The episode pushes as hard as it can to engender sympathy for a Pete who knows exactly how pathetic he is. Though I'm resistant to ever caving in completely (despite being told that "eventually you'll see he's not that bad" etc), he certainly seemed less offensive this time than any other, a feckless child in over his head, worth pity more than scorn. In some ways, Betty - whose crisis was so poignant two episodes ago - is on an opposite trajectory. Her uptight judgmental nature is wearing thin; in a show full of characters who present an artificial facade that they know is artificial, Betty seems far less self-aware. On the other hand, at times she is so ridiculously mannered that she grows almost lovably comic. 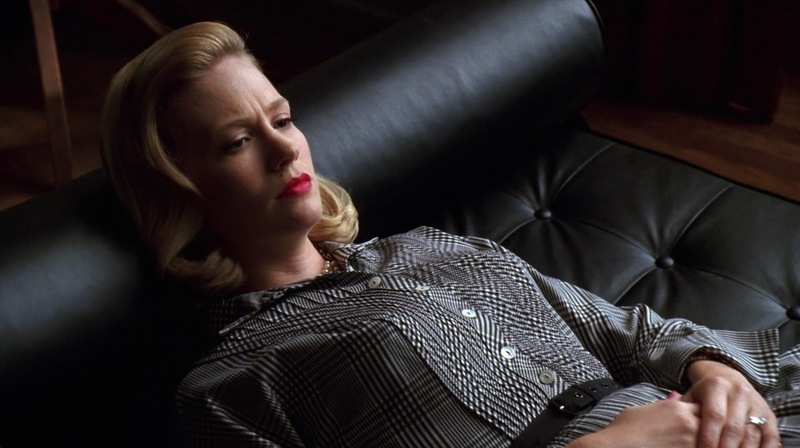 The scene with the weird little kid, without entirely losing sight of the sadness at its core, is also one of the funniest in Mad Men so far; as the "everything in its place" Betty inexplicably scissors away a blonde strand and the boy solemnly worships his new treasure on his way to bed, I found myself laughing out loud. Here and in several other scenes I can recognize the distinctive offbeat comic touch of director Tim Hunter. Hunter brought a similar sense of just-barely-restrained wackiness to several episodes of Twin Peaks as well as the cheerfully eccentric River's Edge (which offers the signature Crispin Glover performance, aside perhaps from the same actor's simultaneous appearances on Letterman to promote the Hunter film). "New Amsterdam" also provides Lisa Albert's writing debut for the series - while I'm less familiar with her work than Hunter's, her teleplay does convey a new, notable ambiguity in its depiction of power relations. Pete squirms under his parents' heels, but we later learn they don't actually have much money. He is ground into dirt by Don and Roger, who privately fume that Bert won't fire the brat. Bert luxuriates in his office, allowing himself various quirks that would not be tolerated, but even he feels Pete's position is unassailable. Betty smirks about Helen's wayward household yet lacks, and maybe subconsciously envies, the divorcee's frank independence and freedom, while Helen flaunts a knowing brashness toward the demure housewife which Betty reads as jealousy of her own more stable lifestyle. As in a game of rock, paper, scissors, no character has a clear, pure advantage over another; each has their own authority and their own debasement and even the hierarchy of that chain isn't as clear as it initially seems. Next: "5G" • Previous: "Marriage of Figaro"